Rock Splitting Technologies is the distributor for Hirado products - dealer inquiries are invited. 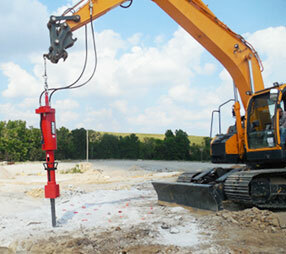 The splitter is used to break rock and concrete. This splitter is the N50W95A700 series which uses a feather and wedge system. It hangs from an excavator and uses the existing excavator hydraulics to push the wedge between the feathers which creates pressure. 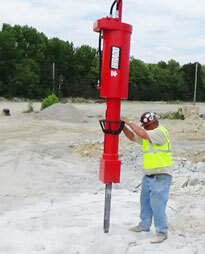 The Rock Splitter's wedge requires a pre-drilled 4" hole that is 4.3 feet to 5 feet deep. The wedge travels 700mm or 2.3 feet into the hole. 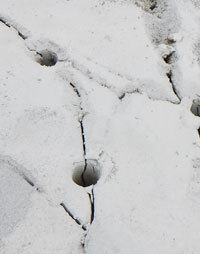 The breaking of rock or concrete will happen immediately. 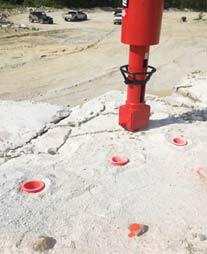 Splitter uses 21 MPa working pressure, which can be supplied by most excavators, creating a splitting pressure in excess of 2,700 tons. Equipped with relief valves to help prevent too much pressure and damaging the splitter. Equipped with pressure gauge for easy maintenance. Easy to replace wedge and counter-wedges.